Do you want to learn how to enjoy camping made easy? 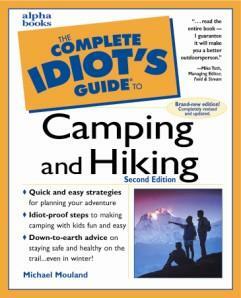 If so, The Complete Idiot's Guide to Camping and Hiking just might be the perfect camping how-to guide for you! LoveToKnow Camping recently interviewed Michael Mouland, the expert behind this down-to-earth guidebook written especially for camping beginners interested in learning how to prepare for an enjoy rewarding camping adventures. What inspired you to write the CIG to Camping and Hiking? I had a very good friend who was working in broadcasting suggest we go camping one very hot weekend when we were living in New York. I grew up in a big city and always lived in big cities and the idea sounded like a good way to get away from the heat and stench that goes along with a New York summer. I was involved in boating, kayaking, and canoeing, so it wasn't such a big stretch to imagine spending a few nights on an "extended picnic" sleeping in a tent. Why do you think many people are intimidated by the idea of camping? People think they need a lot of gear, and they are afraid of leaving their creature comforts behind. In fact, only a minimal amount of gear is required and camping is a lot more comfortable than say a night in a typical budget hotel. Often you have great natural amenities within reach, such as a lake or beach. There is also the fear of the wilderness, not to mention the animals that live in the woods. You have to remember that in fact animals are more afraid of you than you are of them --remember bunny rabbits, chipmunks, and squirrels aren't going to tear you apart while you sleep. They may make a lot of noise trying to get into the cooler, but they're not going to hurt you. What advice do you have to offer beginning campers about advance planning for their first camping trip? Check the weather forecast, and, of course, read my book. If you don't have the basics such as a tent, sleeping mat, beg, borrow, or rent what you need. A lot of your equipment can be re-purposed using items you already have, such as pots, pans, plates (paper), and so on. Any excursion involves cooking to some extent, so make sure you bring along enough food, drink, and snacks for the trip. Don't forget insect repellent -- yes, this is the outdoors and insects are often the most irritating aspect of an outdoor excursion. What type of campground do you recommend for beginning campers? I would try "car camping". That is, choose a drive-in location where there is a bathing facility, washroom, an on-location store where you can pick up provisions (one always forgets to bring something, by the way). If you're traveling with kids, many parks have playgrounds and kid-friendly attractions, hikes, and so on that will help introduce familiar things into the outdoor experience. What do you recommend a camping newbie do to avoid or overcome common beginner mistakes? Check the weather. On one of my first times out, we arrived at our campsite and spent an unpleasant half-hour pitching a tent in the rain and cold. You want your first time to be pleasant one, rather than a "character-building" experience. What must-have supplies do you recommend for camping newcomers? I suggest a good tent, a good sleeping mat, a decent sleeping bag, and a pillow of some sort. You can use regular cooking equipment for preparing food, but you'll also need a portable stove to heat up pancakes or eggs in the morning, and to boil water for coffee, mac and cheese, spaghetti, and so on. It's fun to try and cook over an open fire, but such fires are hard to control when cooking. Also, good outdoor wear made of synthetic fabrics such as fleece are necessary to deal with changing weather conditions. Layering is important if you live in a region where nights are cold and days are hot. What other advice do you have for people who would like to master the art of camping made easy? Once you're comfortable with the basics, you can try a backcountry trip as part of a group or on your own. You might like to use a canoe (as I do) to get to your campsite, a trail bike, or your feet, and you'll find your own brand of camping as you experiment with new regions and parks. LoveToKnow Camping would like to thank Michael Mouland for taking the time for this interview, and wishes him happy trails for many years to come. For more great camping made easy tips from this knowledgeable author, see ''The Complete Idiot's Guide to Camping and Hiking.